Summary: Lex Luthor’s sensors detect that Superman’s casket is missing. Supergirl investigates underneath the tomb, arousing the suspicion of the Metropolis police officers monitoring the memorial. Dan Turpin follows Supergirl through a subway ventilation shaft entrance and soon finds himself in Underworld. He sees Supergirl is under attack for trespassing and tries to help. Eventually, Supergirl carries Turpin to safety after one Underworlder drops several grenades. Meanwhile, Gangbuster returns to action and teams up with Bibbo to stop a gang of drug dealers. Review: Superman is still dead, although only two pages are dedicated to Lois and the Kents mourning, re-establishing what we’ve already seen in other chapters. This issue moves the focus to the peripheral characters surrounding Superman, such as the street-level vigilante Gangbuster. I have only a vague knowledge of who Gangbuster is supposed to be, but there’s enough information in the reprint collections to infer that he’s a retired vigilante who admires Superman. And now he makes clear he’s Cat Grant’s ex-boyfriend. I’m not sure why the Superman titles felt the need to establish such a character, and I recall some readers complaining about the introduction of more heroes within Metropolis when Superman is already there, but I always have a soft spot for the street-level hero. Gangbuster’s design isn’t exactly elegant, but the basic idea seems to be he’s taken a cop’s riot gear and repurposed it for vigilante work, which is a reasonable starting place for a costume. There are far worse examples of ‘90s vigilante fashion, of course. I’m assuming Gangbuster was created as some form of down-to-earth contrast to Superman, so bringing him out of retirement to deal with Metropolis’ criminal element following Superman’s death is a decent idea. Not that the books really go anywhere with it, since the four false Supermen are soon to be introduced, quickly followed by the actual Superman’s return. Following the lead of Action Comics, Supergirl turns out to be the star of this issue. There isn’t a lot of depth to the story, it’s essentially killing time until the next chapter reveals Cadmus’ plan, but there are some entertaining action scenes. Tom Grummett helps a lot, drawing a very attractive Supergirl and a host of monsters that aren’t exactly Kirby-esque but do evoke a fun Silver Age feel. Dan Turpin is also thrown in, partially for comic relief, but also to fulfill the role he always plays, that of the tough-as-nails cop who refuses to back down to any superhuman menace. Much of the issue is arguably filler, but it’s never dull and the action scenes look great. Summary: Mitch arrives in Metropolis to apologize to Superman’s “wife” for his role in Superman’s death. Jimmy Olsen informs Mitch that the woman is a fraud, then takes him out to lunch with Bibbo. Jimmy and Bibbo assuage Mitch’s guilt and take him to visit Superman’s memorial statue. Meanwhile, the JLA gather to read the mail addressed to Superman. They perform good deeds, including the rebuilding of Mitch’s home. Wonder Woman visits Mitch’s father, which leads to him reconciling with Mitch’s mother. At Clark’s apartment, Lois meets with Lana Lang and the Kents. Later, Cadmus agents drill into Superman’s tomb. Superman has a Christmas Eve tradition of reading mail addressed to him and helping those in need. According to the JLA, Superman was buried a week before Christmas Eve, even though none of these stories seemed to be taking place in late fall/early winter. Mitch blames himself for calling Superman back to save his family, which allowed Doomsday to escape to Metropolis, where Superman had to face him without the JLA. Mitch also feels guilty for “jinxing” Superman by mocking him earlier that day. Mom, Apple Pie, etc…: It’s an entire issue dedicated to performing good deeds and helping others. Wonder Woman even acts as an Amazonian marriage counselor. Total N00B: Lana has blonde hair this issue. I have no idea if this is a coloring mistake or not, but I’ve always known her as a redhead. Review: Another sentimental issue, and although Jurgens’ dialogue is painfully clunky on a few occasions, the story is a decent examination of how Superman’s death is affecting the people he knew as a civilian and a hero. The best scenes in the issue involve Lois returning to Clark’s apartment to clean it out -- since Clark isn’t a confirmed casualty, she can’t cry in public without arousing suspicion that he’s Superman, which only makes her mourning even harder to endure. She’s met there by Clark’s parents and Lana Lang, who all agree to keep Clark’s secret even if it’s inevitable that someone will eventually discover the truth while investigating Superman. (Three Superman books have already been published since his death, they claim.) I like the way Jurgens is incorporating a real-life media circus into the issue, one that may or may not have been inspired by the actual response to this storyline. A fake “Mrs. Superman” calling her own press conference, and the local media actually attending, is the type of thing that’s not so hard to imagine now. Mitch, the delightful teenage punk from issue #74, returns with a new attitude. After his actions in his previous appearance, Mitch is now consumed with guilt over Superman’s death. Mitch seemed like a two-dimensional throwaway character when he debuted, there to verbalize the perception that Superman’s a tired goody two-shoes that no self-respecting Gen Xer could ever idolize. He’s fleshed out a bit here, although I find him much more entertaining as a relentless brat. The idea that he’s magically seen the light and is now going to respect his mother, while the JLA simultaneously reunites his parents and rebuilds his house, is also spreading it on a bit thick. It’s a Christmas issue, though, and a story about applying Superman’s ideals to the real world. A little cheese is okay, I suppose. Summary: Superman’s body is taken to Centennial Park. A large crowd gathers to watch the funeral procession. A member of the Kanad Liberation Force attempts to kill the president of Kanad, who is walking in the funeral procession, but he’s stopped by Batman. Nearby, Robin protects Jimmy Olsen from the armed guards of an agent who’s trying to buy Superman’s death photo. The crowd grows unruly, but eventually settles down. In space, Lobo hears a rumor of Superman’s death but refuses to believe it. In Smallville, the Kents have their own funeral for Superman. After receiving a call from a distraught Lois, the Kents promise to visit her. Irrelevant Continuity: The agent attempting to buy the licensing rights to Jimmy’s photo appears to be Rex Leech, who will later appear in this storyline as Superboy’s manager. Mom, Apple Pie, etc…: The mourners watching the funeral procession are inspired by Superman’s example to stand up to bullies and to reach out to those who are hurting. I Love the ‘90s: One of the mourners has a high-top fade and the Superman logo shaved into his hair. Also, Bill and Hillary Clinton speak at the funeral. Review: The most emotional issue yet, the story is granted almost an entire issue of mourning, although a few action sequences still have to be shoehorned in. Simonson is well chosen as the person to handle the funeral issue, since she seems the most at ease with writing human emotions and the least interested in fight scenes. Jon Bogdanove uses the issue as an opportunity to play with different caricatures, which is something I doubt we would’ve seen from any of the other artists. He doesn’t go so cartoony it hurts the sentiment, but if you’ve watched the documentary on the Superman: Doomsday DVD, you can easily spot which random citizens are creators he’s snuck in. My favorite scene is the one that has Roger Stern (or is that Jackson Guice?) cast as the street vendor selling t-shirts and “bagged” newspapers with memorial armbands. Bibbo initially wants to kill the guy, but when he realizes that the vendor’s trying to provide for his family, Bibbo buys his entire stock and offers him a job at his bar. The issue is great at scenes like this, which manage to be touching without crossing the line over into cheese. The Kents have a genuinely poignant moment when they bury some of Clark’s belongings in the crater they found him in as an infant. They’re not invited to the attend the funeral because they’re not “big shots,” and they’re sickened by the media coverage of the event, so they have their own ceremony in honor of him. Lois, who refuses Perry White’s offer to represent the Daily Planet at the funeral, has her own drama. Calling the Kents and confirming Clark’s death will make it real, which she’s trying to avoid at all costs. She knows it’s the right thing to do, but she can’t bring herself to do it. When she finally summons the courage, she breaks down, and for the first time in the storyline so far, Lois’ pain actually feels authentic. This is the kind of issue you need in order to properly execute a high-profile death. Ideally, the flagrant attempt to pull at heart strings should be reserved for characters intended to be dead, but if you’re willing to buy into the storyline’s premise, this is a solid funeral story for Superman. Summary: Westfield wants Superman’s body for study at Cadmus’ headquarters, but he faces resistance from the Metropolis police. Lex Luthor sends Supergirl and Team Luthor to the city morgue to stop the conflict. Soon, Luthor and Mayor Berkowitz arrive with an order from the President, declaring that Superman will have a proper burial in Metropolis. 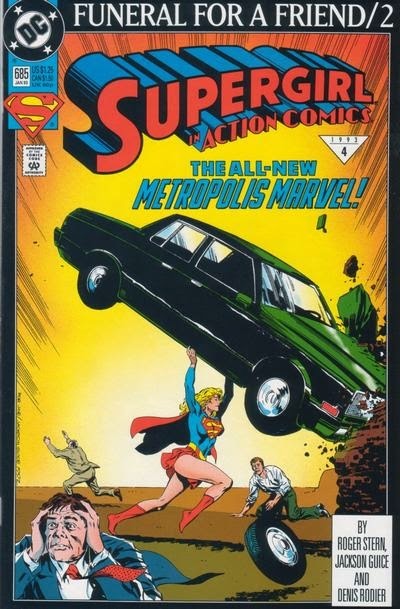 As the world reacts to news of Superman’s death, Supergirl patrols Metropolis and stops a robbery. That night, Bibbo closes his bar and reflects on why he’s alive while Superman is dead. 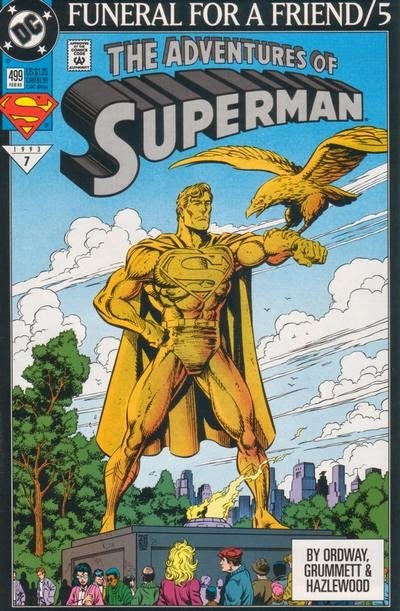 Guardian remarks that Westfield has held a grudge against Superman since Superman #58. Jimmy remembers Lois named Superman in Man of Steel #1. Citizens rescued by Superman in the past reflect on the events of Action Comics Annual #1 and Superman #27. In Adventures #498’s final page, Jimmy walks Lois home. This chapter presents the same scene, although much of the dialogue doesn’t match, and Lois actually refuses to let Jimmy walk her home. Total N00B: Guardian says that Westfield’s actions are the kind of “lunatic stunt” that Dabney Donovan would’ve pulled. We all know what a nut that Dabney Donovan was, right? Review: This issue is far more focused on mourning than the previous chapter, although the plot still leaves room for numerous action sequences. The issue opens with a standoff with Cadmus agents, goes quiet for a few pages while everyone reflects on Superman’s passing, then returns to the action when Supergirl takes over Superman’s patrol over Metropolis. The twist is that her lover (?) and employer Lex Luthor, Jr. is actually using her for publicity purposes. Luthor’s furious that someone else killed Superman, but he’s willing to accept the adulation that comes with being “chief mourner” and the person behind Metropolis’ new protector. That’s not a bad concept to explore, and the prospect of Supergirl taking over this title also have potential. It turns out to be a brief gimmick, however, as Supergirl is pushed aside in favor of the “Who’s the Real Superman?” mystery in just a few issues. 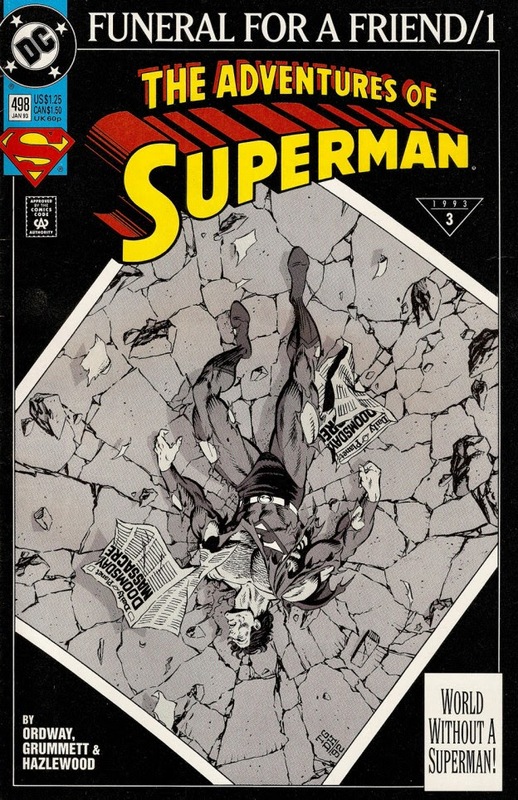 Stern does a credible job of showing how Superman’s death is affecting Metropolis, giving the point of view of everyone from the average citizen to some of the supervillains he’s faced over the years. It’s thorough in a way I’d expect Roger Stern to handle such an event; not overly sentimental, but thoughtful enough to do what the story needs to do. Summary: Paramedics attempt to revive Superman, but receive no response. Westfield arrives with Cadmus employees to take away the bodies of Superman and Doomsday, but he faces resistance from Dan Turpin, who knocks him out. Guardian watches as Dr. Hamilton and Bibbo use a high-power energy device to resuscitate Superman, but Dubbilex declares that he senses no brain activity. Meanwhile, Lex Luthor recovers Supergirl’s body. Eventually, she morphs back into her human form. Later, Cat Grant broadcasts the news of Superman’s death. Jimmy Olsen and Perry White realize that Clark Kent is among the missing and attempt to comfort Lois. Irrelevant Continuity: A character named Kitty Faulkner at S.T.A.R. Labs has examined Superman in the past, according to Lois and Jimmy. A footnote points to Superman #4 and #40. Gangbuster mentions a previous encounter with Metallo in Adventures #491 that lead to him retiring. Total N00B: Cat Grant has a son? And she’s apparently dating a retired vigilante named Gangbuster. 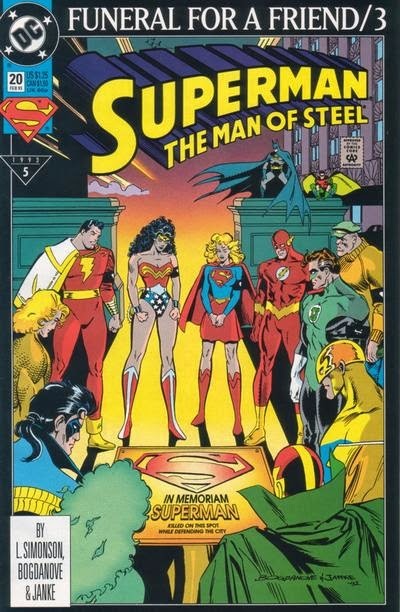 Miscellaneous Note: This storyline was originally billed as "Funeral for a Friend," but was later reprinted in trade form as World without a Superman. 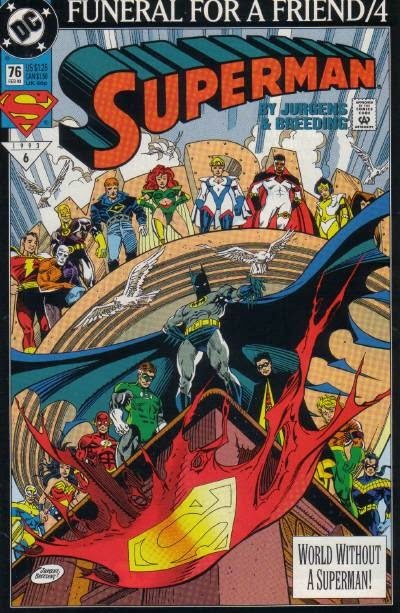 Review: I’m continually amazed at how non-pretentious these ‘90s DC event comics can be. What do you do in the issue after you kill Superman? You follow up on the very next second and just present a straightforward story about people trying to resuscitate the guy. There’s no pretense of art or of a meaningful statement being made here, it’s simply the next chapter of continuity in the story. In a way, this is admirable (and evidence that the creators didn’t know that the mainstream media would turn the stunt into a national news story). There’s no illusion that this is anything other than a superhero comic, which means there are a few emotional beats, but it’s certainly not an examination of the grieving process or a deep reflection on the death of American innocence. Much more thought is put into the practical applications of how Superman could receive CPR. The only commentary in the issue is another scene of a ‘90s kid rejecting the “big weenie” Superman, which is more of a parody of comic fans of the time than any grand statement about society. I consider this a legitimate way to continue the storyline, although a bit more reflection would’ve been nice. The tone of the story is oddly unsentimental, and doesn’t seem to be putting a lot of effort into selling the idea that Superman is Dead. The Kents and Lois Lane have some nicely executed mourning scenes, but overall, the issue feels like it could’ve been the middle chapter in any number of big superhero comic events. Summary: At a hearing on mutant legislation, Henry Gyrich attacks Xavier with a device that sends him into a coma. Gyrich is restrained, while Xavier is left near death. The attack on Xavier soon motivates disenfranchised mutants into waging war on humans, a war Magneto is eager to lead. As Xavier’s condition worsens, the X-Men realize that only advanced Shi’ar technology can save him, but there’s no way to reach Lilandra in time. Cyclops, Jean Grey, and Wolverine infiltrate Magneto’s base before he can launch his attack on Genosha. Jean convinces Magneto to “supercharge” Xavier’s brainwaves with his powers, so that Lilandra will realize Xavier is dying. Magneto agrees, and soon stands with the X-Men as they watch Lilandra take Xavier to the Shi'Ar home world. Henry Gyrich doesn’t match his previous model at all. He now has black hair and no sunglasses, with a personality much closer to that of the unhinged Graydon Creed. Gyrich has no clear evidence Xavier is a mutant but attacks him anyway. Sunfire and Feral are the mutants leading the charge against humans on Genosha, until Magneto arrives and takes over. Morph returns, impersonating Xavier on a televised message designed to calm angry mutants. The idea of Lilandra taking a critically wounded Charles Xavier to the Shi’ar Empire comes from Uncanny X-Men #200. Saban Quality: Jean Grey’s costume is continually miscolored throughout the episode, with an extra strip of blue appearing on one side next to the giant blue stripe that’s already in the middle of her uniform. Review: After a seventy-six episode run, making it one of the longest-running action cartoons in American history, X-Men finally concludes. X-Men arguably hasn’t aged well, but overall the show deserves a lot of credit for pushing the boundaries of what’s expected from kid’s entertainment and for introducing a new generation of fans to the characters. (It’s very possible that the X-Men film franchise wouldn’t have gotten off the ground without the success of the Saturday Morning series.) I wish I could say “Graduation Day” is an incredible closing chapter for the series, but the truth is the best final episode the show could ever receive is “The Final Solution,” all the way back in the first season. “Graduation Day” has a few poignant moments, particularly when Xavier gives every X-Man a small speech while on his deathbed, but the episode is marred by a busy plot and, not surprisingly, some terrible animation. This is the sixth and final episode animated in the “new look” style used to close out the show’s run, and it’s also one of the weakest. The new models divorce the show from the comics source material without really adding anything in return. Too often, the series resembles something Hanna-Barbara hacked out in the early 1980s, a problem that’s painfully evident this episode. Out of six, only one episode has actually utilized the new designs well and remained competitive visually with one of the “outdated” looking episodes. For the final episode, you might expect some discernible increase in quality, but the bulk of the episode is clumsy and lifeless. There is one bright moment, during the X-Men’s fight with Magneto on Genosha. Out of nowhere, for around a minute, the animation dramatically returns to the quality Philippines Animation Studio previously brought to the show. It seems obvious someone decided to bring in the studio’s A team for this scene, a cruel tease of what a true series finale for X-Men could’ve looked like. The story is oddly ambitious for the series, especially when you consider that the two-part Ambien substitute “Storm Front” was originally going to be the show’s finale. Having Xavier face death while Magneto assembles an army of mutants for his long-threatened race war is an appropriately big idea for a closing story, but there’s no way that’s going to fit into twenty minutes. This should’ve been the story reserved for the four-part “Beyond Good and Evil,” or perhaps the show should’ve been even more ambitious and dedicated all of the six closing episodes to this storyline. In retrospect, this episode is an unlikely precursor to everything from the “Eve of Destruction” storyline in the comics (the predecessor to Grant Morrison’s run) to the third X-Men movie. There’s a lot that could be done with these ideas, but almost all of the impact is blunted by the rushed execution. Actually, every time anyone in any medium tries to do the giant “Magneto wages war” storyline, the execution is always botched. Credit to http://marvel.toonzone.net/xmen/ for the screencaps. Summary: Sam Guthrie becomes a local celebrity after using his mutant powers to save his father during a mine collapse. A government agent named Kirkland attempts to recruit Sam to join a “mutant Peace Corps” but Sam refuses to leave home. Rogue visits Sam after the X-Men discover his powers, attempting to recruit him for Xavier’s school. Meanwhile, Gambit investigates the government agency that’s pursuing Sam and is captured. Rogue soon rescues Gambit, as the rest of X-Men arrive in Sam’s hometown. Kirkland sends an army of robots and the brainwashed mutant Unit-1 to attack the X-Men, but the team prevails. The Guthrie family leaves town, and Sam decides to decline Rogue’s offer and stay with his family. Sam Guthrie, Cannonball, makes his first full appearance on the show. He previously appeared in a brief cameo during a Cerebro montage, already wearing his X-Force uniform. Paige Guthrie also debuts, much younger than she appears in Generation X as Husk. All of the X-Men appear this episode, but the only ones with speaking parts are Rogue, Gambit, Beast, and Professor Xavier. Jean Grey’s hair now matches her look in the comics. “Um, Actually…”: Cannonball, and the rest of the Guthrie family, are incorrectly given brown hair. Also, in the comics, Sam’s father died of Black Lung Disease before Sam’s powers emerged. Approved By Broadcast Standards: The censor notes for this episode are online. Surprisingly, as strict as the censors have become during this era of the show, the United States military is allowed to be portrayed as the villain. I Love the '90s: Kirkland has a gigantic cellphone with a very elaborate design. Review: Unless you were desperate to see Cannonball on the show, this episode can easily be thrown into the “Forgettable” pile and dismissed. 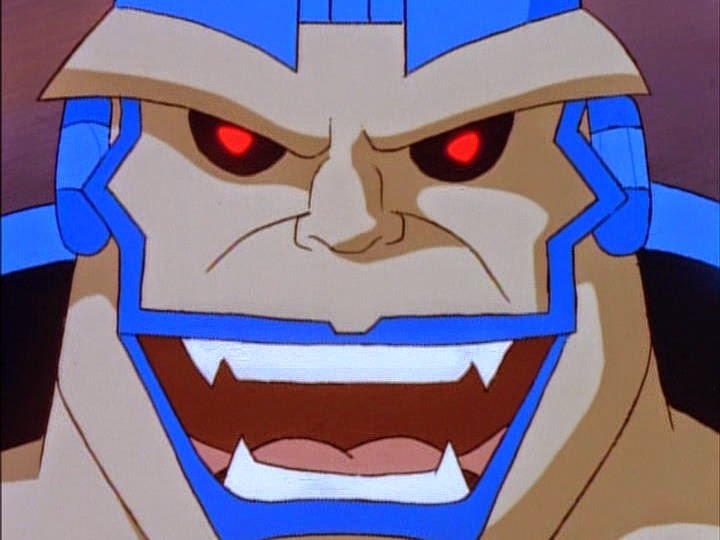 The censors have removed most of the teeth from the show by now, so the episode barely has any action (even Gambit’s capture by Kirkland’s robots is kept off-screen) and the character work is just mechanical and dull. Those horrendous “Southern” accents, most of them performed by Canadians, don’t do the episode any favors either. 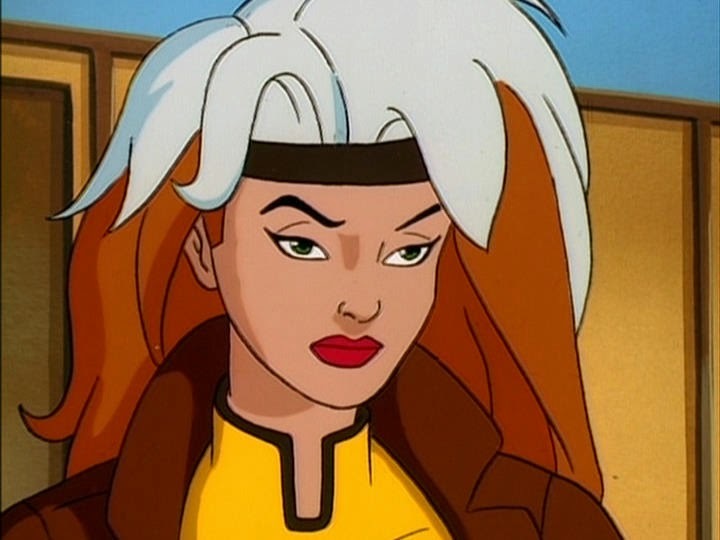 Even Lenore Zann sounds rusty as Rogue this episode, delivering perhaps her worst performance as the character. The villains are also painfully dull, as the series finally gets around to introducing the generic Evil G-Man who wants to exploit mutants. This is particularly egregious in the cartoon’s continuity, since as even Cannonball points out, the President in this reality is a mutant supporter. We’re to believe that the government is running nasty anti-mutant conspiracies even when everyone’s boss is publically pro-mutant? Lame villain, lame execution, and unfortunately, even more lame animation. Summary: In 1888 London, Dr. James Xavier investigates Jack the Ripper’s ties to his former contemporary, Dr. Nathaniel Essex. Xavier explains to the authorities the story of Essex, who grew obsessed with the works of Charles Darwin in 1859. Believing that the study of mutation could lead to a cure for his sick wife Rebecca, Essex began experimenting on mutants. Xavier exposed Essex and defended the mutants from a mob, instead pointing their attention to the true monster, Essex. Essex disappeared, but Xavier believes his trail leads to London. In secret, Jack the Ripper gives Essex a sample of genetic material. Essex escapes capture once again, using the abilities he’s gained from mutant research. This episode has a few similarities with the Further Adventures of Cyclops and Phoenix miniseries, although the writers say that only the first issue of the series was completed when they penned the script. Not only does Xavier’s ancestor have a role in the story, but there’s also an appearance by a Lord Grey, who is presumably a relative of Jean Grey. Lord Grey heads the Grey Hall of Science and is the father-in-law of Nathaniel Essex. Review: “Descent” is the only episode of the series not to feature the X-Men, with only Xavier making a brief cameo in the final seconds. That’s pretty daring by the standards of Saturday Morning TV, and it’s safe to say it’s the last experiment with the form the series is going to be bringing us in its final days. Once again, the impact of the story is muted by the new look of the show. So far, only one episode (“The Fifth Horseman”) has used the new designs effectively and managed to pass as a Philippines Animation Studio job. The animation this episode is as clunky as anything AKOM ever produced, with the added burden of unattractive cartoony faces and bland backgrounds that don’t match the story’s content at all. I realize that the animation quality in earlier seasons was often nothing to brag about, but at least the “dark” episodes truly looked dark. The “Days of Future Past” and “Till Death Do Us Part” two-parters did have mood if nothing else, an element this episode desperately needs. If you’re able to overlook the poor design choices, the script is another solid effort by Melching & McDermott. Admittedly, the plot is based on a premise that usually annoys me in flashback stories, the massive coincidence that has an existing character’s ancestor behave in the exact same manner as his modern day relative, and the fluke that all of these characters will have ancestors with connections today, but the execution manages to get away with it. Dr. James Xavier is a sympathetic figure throughout the episode and allowed enough personality to be more than just a stand-in for “our” Xavier. Essex is about as creepy as a villain can get on Saturday Morning, and the decision to work Jack the Ripper into the story is a pretty shocking choice given the target audience. 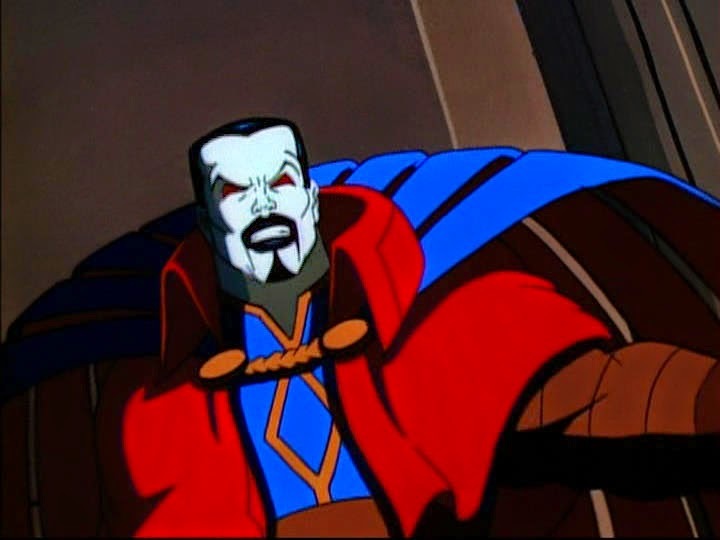 I don’t know if the kids watching at this time picked up on all of the nuances, but I’d like to think that at the very least they appreciated getting an origin for Mr. Sinister. They received answers much sooner than fans of the comic did, certainly. Had this episode aired earlier in the show’s run, and been given the appropriate visuals to match the content, I think it would’ve been considered a true highlight of the series. Summary: Wolverine visits the grave of scientist Andre Cocteau in Paris. He flashes back to his adventure in World War II as an OSS agent. Accompanied by his back-up, Captain America, Wolverine rescued Cocteau from the Red Skull, only to discover that Cocteau double-crossed him by giving the Nazis their location. Although Wolverine and Captain America defeated the Red Skull and his Sleeper robot, losing Cocteau to the Nazis lead Wolverine to view the mission as a failure. In the present day, Cocteau’s daughter Justine appears at the graveside. She explains that Cocteau never betrayed the Allies; he was a double agent. Wolverine and Captain America were supposed to fail in order to sell his defection. Wolverine doesn’t have bone claws or adamantium claws in the flashback story, staying consistent with Marvel’s rule at the time that Wolverine should only have claws in flashbacks to recent times. He does use a pair of rock climbing claws, however, which he decides to keep throughout the adventure. Characters with a strong resemblance to Sgt. Fury and his Howling Commandos make a cameo appearance at the end of the flashback. Approved By Broadcast Standards: The word “Nazi” never appears in the episode, nor are there any swastikas. Wolverine’s references to “Uncle Adolf,” and the scenes depicting German soldiers occupying Paris, are used to make it clear to older viewers that the characters are Nazis. Review: A WWII-era Captain America series was in development for FOX at the time this episode aired, making me wonder if "Old Soldiers" was commissioned as a backdoor pilot. I’m not sure how kids ignorant of the comics felt about the episode, but seeing Wolverine team up with Captain America gave me a bit of a fanboy thrill at the time, and the episode holds up quite well today. The major failing would be the animation, which has yet to adjust to the show’s “cartoony” makeover, and is suffering from some extremely stiff action and awkward walk cycles. The episode grows more fluid in the final act, making me wonder if Philippines Animation Studio assigned a better team on the climax. If only all of the episodes from this final batch looked as good as PAS’s work earlier in the show’s run. I’d love to see a Wolverine/Captain America WWII adventure animated as well as “Cold Comfort” was. The plot is reminiscent of many of Wolverine’s flashback adventures in the comics. The action is set in WWII-era Paris, Wolverine teams up with an established Marvel Universe figure, there’s a hint of romantic tension between him and Justine, and there’s even a present day framing sequence that has an “old friend” from his past recognizing him. The idea that Wolverine is just as old as a WWII vet hasn’t been broached on the show before, and even though it’s taken the series forever to get there, I’m glad this area of continuity has finally been acknowledged. Wein seems to be intentionally evoking the feel of old serials during the adventure, but he gives the story enough personality to avoiding the feeling that it’s pastiche and only pastiche. 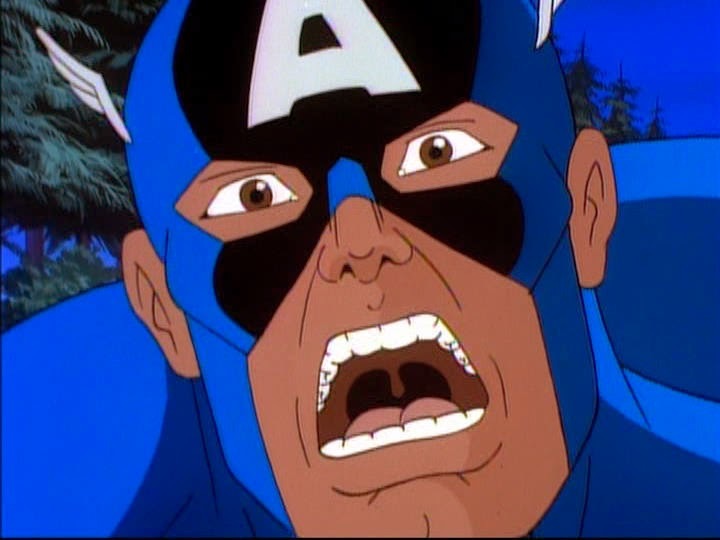 If only this had aired years earlier in the show’s run; Captain America and the Red Skull’s designs are an awkward fit for the show’s new look, and this is the kind of story the series needed as it descended into a succession of forgettable one-offs. Summary: Jubilee joins Beast for an exploration of the Andes. They discover evidence of a Mayan Temple, three thousand miles from where it should be. Meanwhile, Fabian Cortez leads the new Four Horsemen on a search to find a young host body for Apocalypse. After their first target escapes, Cortez discovers Jubilee is nearby. Jubilee is kidnapped by the Horsemen and brought to the temple, although new member Caliban is reluctant to harm her due to her past with the Morlocks. Eventually, Caliban turns on Cortez and escapes the temple with Jubilee and Beast. Cortez is left alone in the collapsing temple, as Apocalypse enters this reality and steals his body. 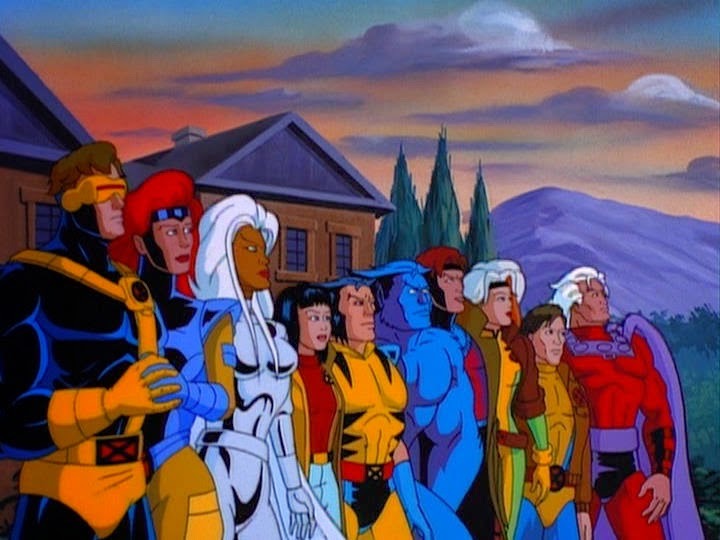 Beast and Jubilee are the only X-Men appearing this episode. Fabian Cortez was rescued by Apocalypse at the end of “Sanctuary Part Two.” Apocalypse has amplified his powers, giving him the ability to power up mutants and turn them into Hounds. “Hounds” and “Horsemen” are used interchangeably in the episode. Apocalypse was trapped outside of time following the “Beyond Good and Evil” serial. The Four Horsemen, with the exception of Caliban, are wearing the red bodysuits with spikes that Phoenix II wore as a costume. “Um, Actually…”: Kitty Pryde’s friendship with Caliban has been transposed on to Jubilee. Also, those spiked bodysuits belong to the Hounds, not Apocalypse’s Four Horsemen. In the comics, those outfits are worn by the slaves of Ahab and the Shadow King (I’m not sure if the connection between those two villains was ever revealed). Review: A vast improvement over “Jubilee’s Fairytale Theatre,” this episode has many of the elements that made X-Men unique in its early seasons. Old storylines are resolved, continuity from past episodes is built upon, and the leads are given distinct personalities and opportunities to play off each other. The Melching/McDermott scripts tend to be more loyal to the comics, giving the episodes less of a generic superhero feel and more of the qualities that distinguished X-Men from most kid’s cartoons. Jubilee and Beast actually make for an entertaining pairing, and it’s a relief to see Jubilee given more of her true personality this episode, as opposed to the annoying kid sidekick role she was forced into in the past. There is yet another example of Jubilee working as a Kitty surrogate, as Caliban is now her pity-friend even though they’ve never really met in the show before, but this isn’t nearly as annoying as the previous episode’s premise. As a fan of the Simonson/Simonson X-Factor run, I was also glad to see Caliban brought into his ‘roided-out servant role, but I do question why there are now three utterly generic Horsemen saddled with him. Once again, we’ve missed a chance to see the Dark Riders brought into animation. Even the Alliance of Evil would’ve been more intimidating than these losers; Whip Guy, Boomerang Girl, and Big Guy with Muttonchops. While this episode is a better showcase of how the new designs can work (the character movements are noticeably smoother and the overall look is less cluttered), it also provides a clear example of how tricky “cartoony” can be. None of the villains are even slightly threatening; even Apocalypse looks like a leftover Pokemon in certain scenes. I don’t know if this decision was consciously made to make the show less intimidating for younger viewers, but the toothless villains undermine any attempt to make the stories genuinely dramatic.